Or rather why we aren’t controlling the ground source heat pump! A ground source heat pump extracts heat out of the ground to heat the house. It works most effectively once the house has reached it’s target temperature. At this point, the heat pump just trickles heat into the building to ensure that it stays at the set temperature. In fact, it will often use additional energy from an immersion heater to get the house to it’s set temperature. It can take a long time for the fabric of the house to warm up – in our case, it took a couple of weeks from a standing start. However, I still suspect that the fabric of the house is warming up and drying out. Let’s not forget that only a few months ago this building was open to the elements. With this in mind, the NIBE engineer has told me to set the heat pump going and not to change it according to a schedule, or even when we go away on holidays. If we were away for a few days, there would be little point in turning the heating off – it would take 3-4 days to cool down and then 3-4 days to warm up. And we would probably use more energy in the process than we would if we just left it on all the time. Let’s not forget with no one here, the windows and doors stay shut and the house is well insulated. So heat loss would be a minimum. It does, however, make sense to turn the hot water off. It only takes around an hour to generate a full tank of hot water and that is from a standing start. If the tank was full of hot water when it was turned off, it might only take 30 minutes to warm up depending on how long it had been turned off for. I need to investigate how we can achieve this. More updates later. In terms of the other controls, we may control the secondary hot water pump (this pumps the hot water around the property to ensure that you get hot water out of the tap within a couple of seconds) and the valves for the towel rail circuits (there are two – one of the old part of the property and one for the new). It will be very straightforward to control these using the Loxone kit. We can set up schedules, over ride buttons as well as being able to access the controls remotely. But other than that, there is little to control on the heat pump. We have installed the latest software on the heat pump and this is automatically control the flow rates of the pumps to the underfloor heating and ground loops. There are thermostats in all of the rooms that control the zone heating. It would be straightforward to replace these with temperature sensors and actuators controlled by the Loxone kit, but it would have little benefit over what is already installed (re-badged Heat Miser units from NuHeat). There are 3 sets of rooflights in the extension (in addition to the Veluxes in the bathrooms). There is one set of rooflights in the kitchen and two sets in the lounge. Each set has 5 panes – 2 of which open. Because of the height of the ceilings, these need to be electrically controlled. The 3 sets of rooflights cost around £6,000. They came with very cheap plastic rocker switches – a bit disappointing given the cost of the windows. We have replaced these and decided to control them using the Loxone kitchen. This means that they can be controlled via switches in the house or remotely via an iPad/iPhone/PC. This gives us the opportunity to automate the opening/closing of the rooflights – e.g. opening when a set temperature inside the property is reached or closing the rooflights when the burglar alarm is set. Interestingly, the attention was for the Loxone kit to only control the lights, but since we have installed it we have found a number of other uses for it. We now have a light sensor connected to the lighting computer. 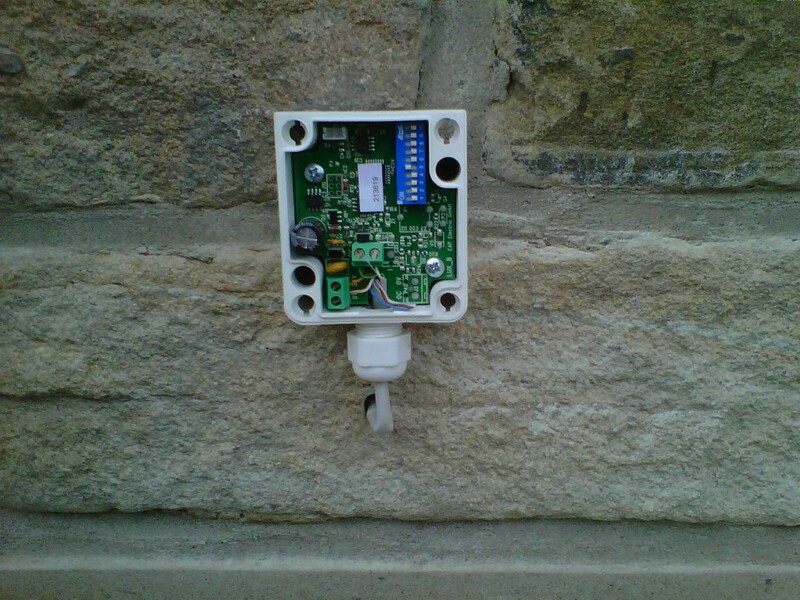 This means that we can programme the lights so that they come on after dark and turn off during the day. It is another relatively cost effective piece of kit from Loxone. The main issue was climbing on the roof to fix it in position. We have sited it on the small apex at the rear of the property (away from any street lighting or security floodlights). It is connected to the Loxone kit using Cat5e cable. One pair of wires is used to supply it with 24v. Another pair of wires send back data on the light level (as a 0-10v signal). This is then connected to one of the Loxone’s analogue inputs. 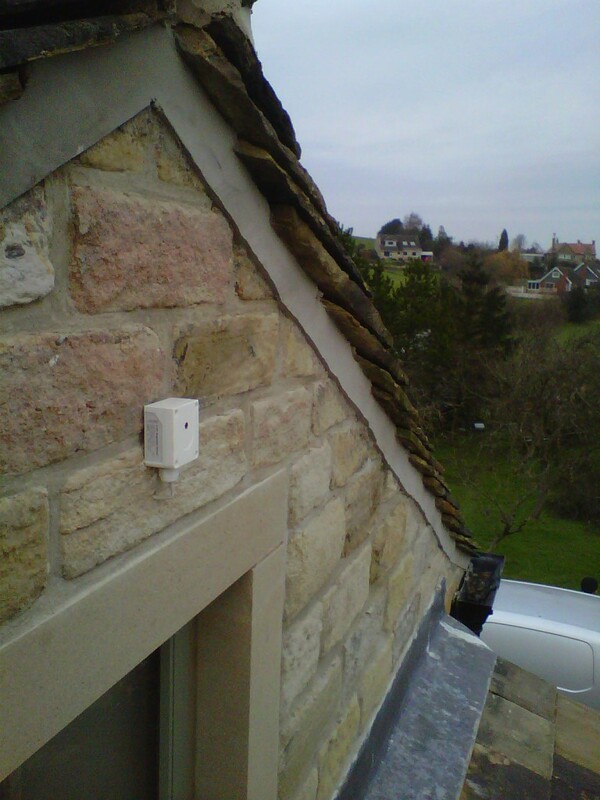 The sensor is positioned high up on the small gable end in the extension. This is away from any light from street lighting or from the security light at the front of the building. Inside the lux sensor. Orange and orange/white used to supply 24v and green and green/white for data. It then simply supplies a 0-10v signal to the Loxone kit based on the amount of light outside. The dip switches can be used to adjust it’s sensitivity. We now have lights in the older part of the property. We have had them for a week or so, but now we have light switches to turn them on! Previously, we had to revert to using an iPad to turn the lights on and off. Bizarrely, I could turn the lights on and off anywhere in the world – except (apparently) the room that I was in as there was no light switch. It doesn’t take long for the novelty of having to use an iPad all the time to wear off. And before you ask, yes, you can use an iPhone too! See previous post for information on the web interface. In this part of the building alone, there are around 20 lighting circuits (a lighting circuit is a group of lights controlled by a switch) and about the same number of light switches. Today we have installed all of the light switches and, after a bit of messing about, the switches do seem to control the right lights (most of the time). Since the mapping between lights and switches is done in software, we can always modify the arrangement later on (unlike in a conventional system). We had to reprogram a few of the switches, but all in all, it went pretty well. We have removed the stainless steel front plates from the switches. This allows the rooms to be decorated without getting paint on the switches (and still being able to turn the lights on and off). For more information, see previous post on light switches. As well as the lights, the bathroom extractor fans are also controlled by the lighting computer. This means that we can configure the system so that the extractor fans do not come on after midnight (say) as this might disturb others in the house. In the upstairs bathroom, there are two lighting circuits. One controls that main lights (and turns on the fan). 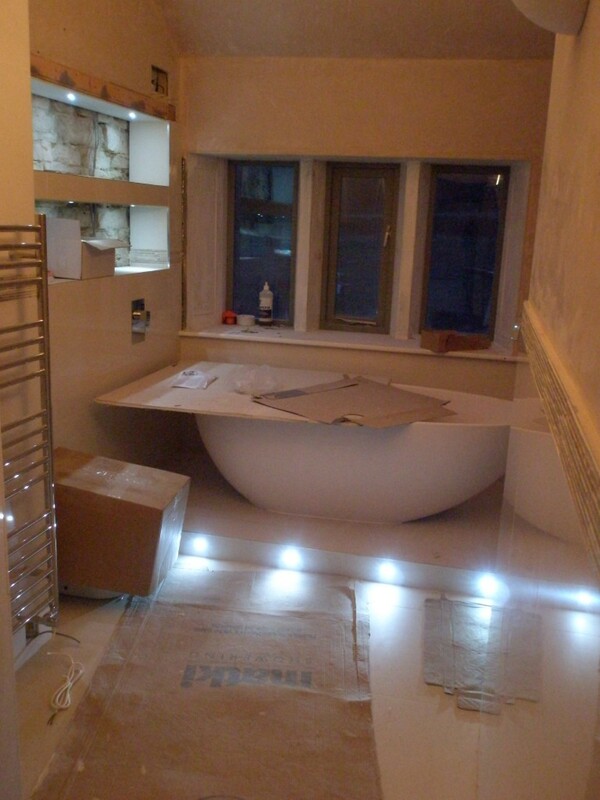 The other controls the LED lights in the shelf and along the plinth for the bath. This circuit does not turn the fan on. This means that you can have a bath and just turn the LED lights on without having the fan running. This is one of the switches with the stainless steel face plate removed. We will put the face plates on once the rooms have been decorated. This is a Schneider GET Ultimate two gang switch. ignore the cardboard box over the toilet and the board over the bath. 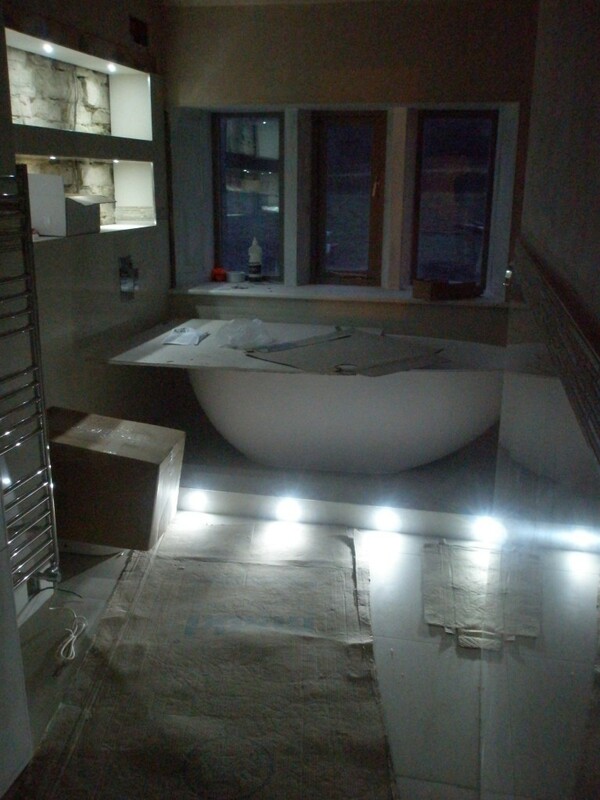 This is the upstairs bathroom with the main lights and LEDs turned on. The extractor fan is running. This is controlled by the left button. And now with the main lights off and just the LED lights on. These are only 1W put these LED lights put out a lot of light. Yep, we managed to turn our first set of lights on today. We have installed around 25 lighting circuits in the older part of the property and today we managed to use the Loxone kit to power up the lights. It was right at the end of a long day, so we only had 10-15 minutes to try it out. But we had 80% of the lighting circuits working in our first attempt! We haven’t got any of the light switches installed, so we were using an iPad to wander around the building turning the different lights on and off. I know it sounds trivial, but this is a major step forward! Tomorrow we will try to get the rest of the lights working in this part of the building. Ignore the ladder! This is a major milestone – the lights in Jo’s office turned on via an iPad. We haven’t installed any light switches yet, but the Loxone system allows us to turn the lights on in the old part of the building. Well, we have the Loxone system installed. There is power to the units in the older part of the building. This will be only half of the system as the other half will be installed in the plant room in the new extension. But with this half of the system powered up, we can get the system configured. The configuration was done over the weekend. 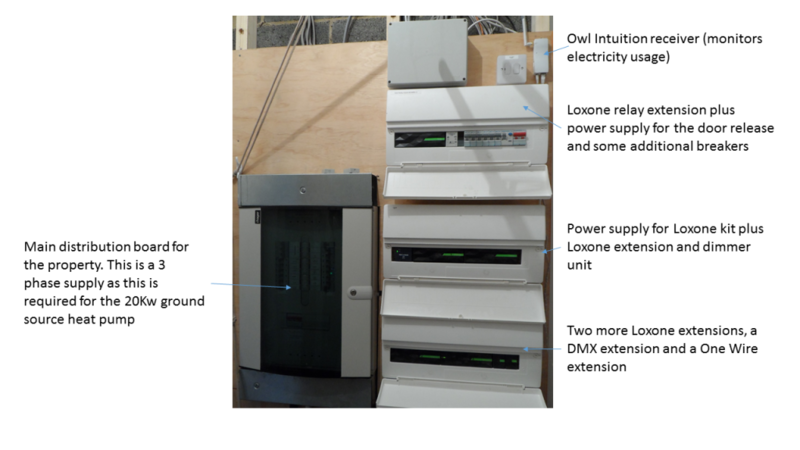 The electrician has connected each of the lighting circuits to the Loxone system. 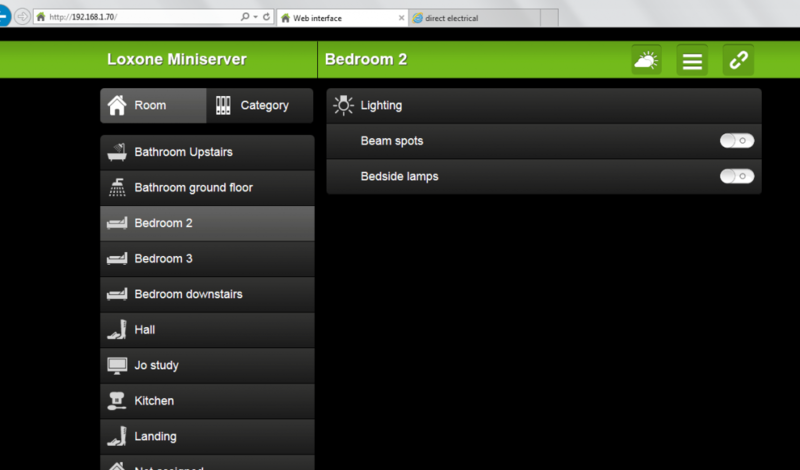 I then mapped all of the lighting circuits against the rooms in which there are installed. The lighting circuits do not have any power to them and the light switches haven’t been installed. However, we can use the interface on the iPad to turn the lighting circuits on and off. Although there is no power to the circuits, you can hear the relays (the electronic switches) clicking on and off. Using the interface on the iPad helps to confirm that the configuration is correct. It also helps highlight any lighting circuits that haven’t been assigned to a room. 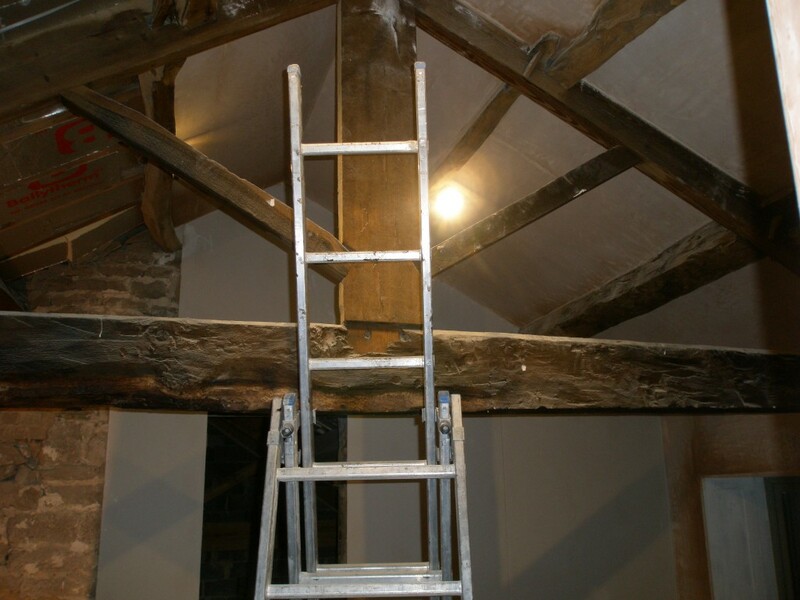 The next stage is to connect the light fittings and then we will be able to turn lights on and off using the iPad. Then we can get the light switches installed. Here are all of the rooms configured for the lights in the older part of the property. You can see there are two lighting circuits in Bedroom 2 (shown on the right) – beam spots and bedside lamps. These can be turned on and off using the web interface. The iPad interface is identical. While work is progressing on the first fix electrics in the extension, we are starting to terminate the cables for the lighting switches. 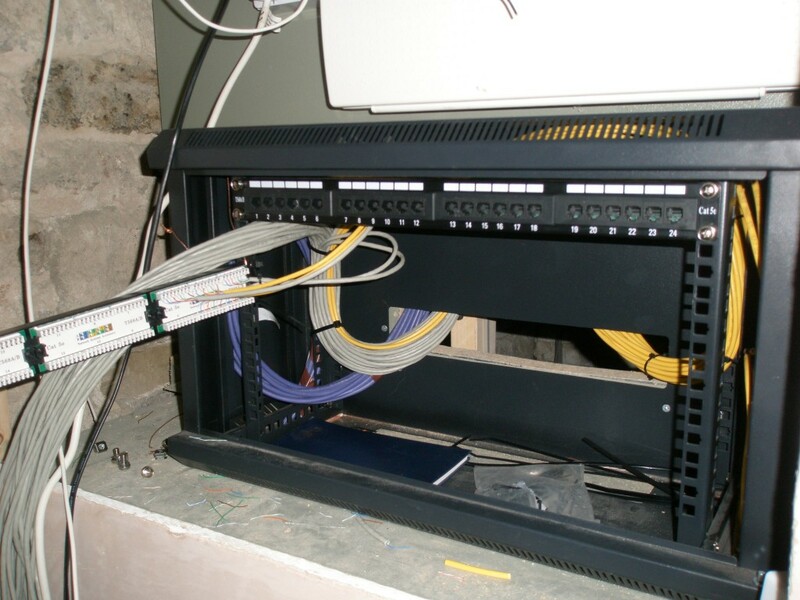 All of the cables of the lighting and data will terminate in patch panel. This allows us to easily test all of the connectivity as well as being able to reconfigure the cabling at a later data. There are 19 lighting switches in the older part of the building. The cables will terminate in a single 24 port patch panel. Patch leads will then connect the relevant port to the correct connection on the lighting computer. 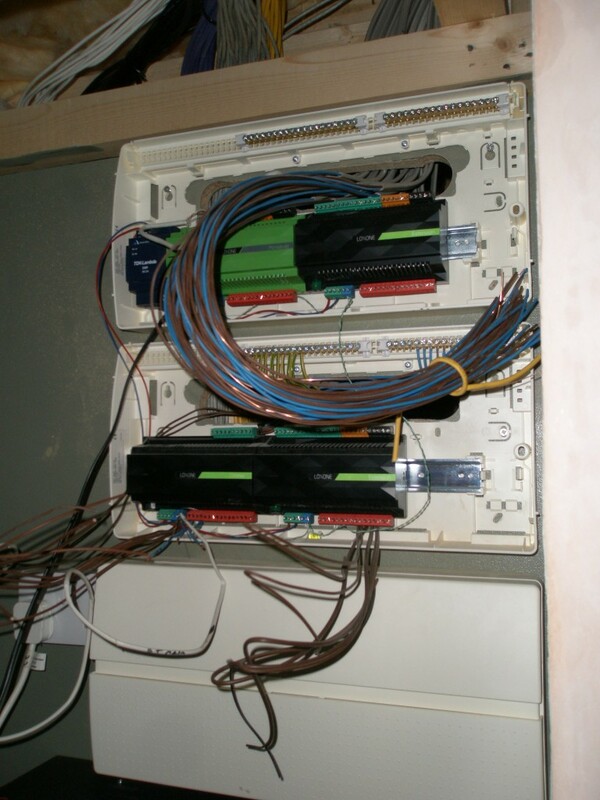 The data connections will terminate in two 24 port patch panels since there are more than 24 data connections in this part of the building. These will be connected to a Netgear network switch that will be connected to the broadband route to provide wired Internet access into each of the rooms. 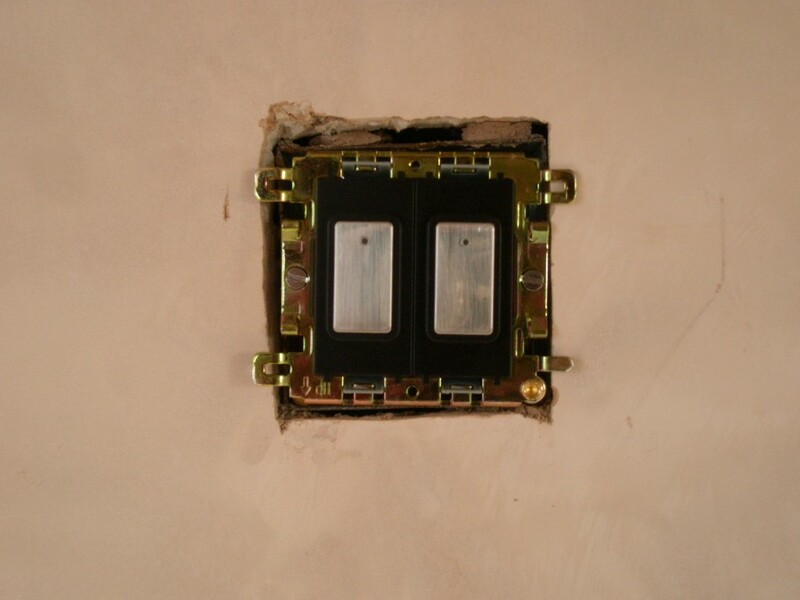 There will be a second Netgear switch in the extension and the two switches will be connected together. It will probably take a few days to get all of this connectivity working! 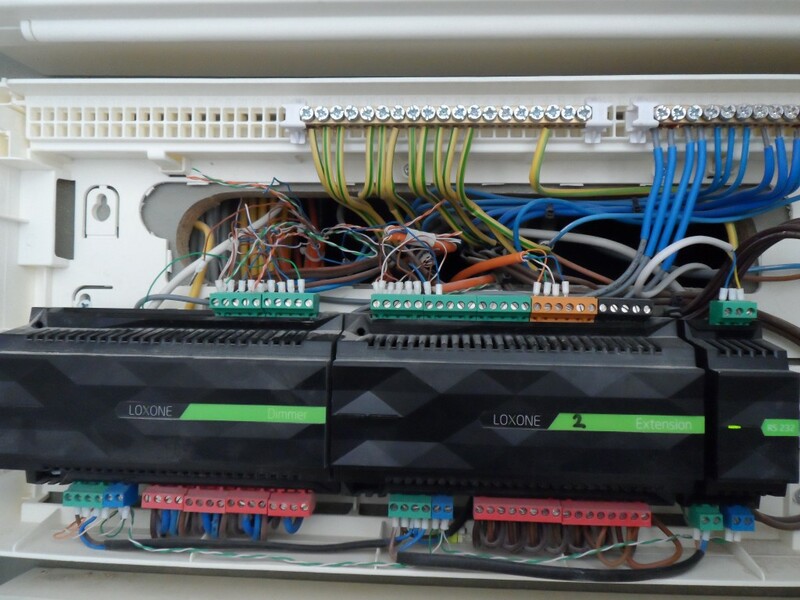 The top two consumer units house the Loxone kit – a server, 2 extensions and a dimmer unti. The bottom consumer unit contains the breakers and RCD. Underneath this there is a small data comms cabinet. All of the Cat5 cables from the lighting switches terminate in this patch panel. There are 19 in this half of the building. 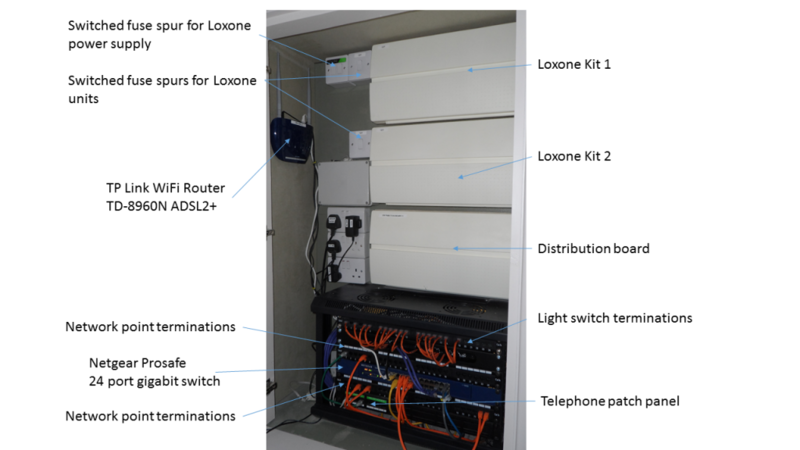 There will then be a lead from the patch panel to the Loxone lighting computer which is housed above.